a) The high reactance of both the armature and field windings limits AC current to a much lower value than DC current (for the same line voltage). b) If solid steel is used for the stator frame, AC flux will produce large eddy currents in the frame with consequent heating. 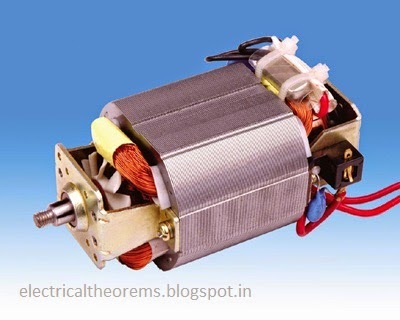 To insure satisfactory operation of the universal motor from an AC power source, some modifications are necessary. The reactance of the series field and armature windings must be reduced as much as practicable. The reactance of the series field winding can be somewhat reduced by using fewer turns of heavier wire. However, it would not be practical to eliminate the reactance voltage drop due to the series field since that would also eliminate the magnetic field. The reactance voltage drop due to the armature winding can be practically eliminated by use of a compensating winding. 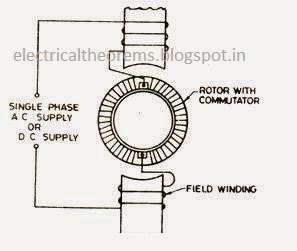 The compensating winding is connected in series with the armature winding (conductive compensation) and arranged such that the ampere-turns of the compensating winding oppose and neutralize the ampere-turns of the armature. To realize this compensation, the compensating winding is displaced by 90 electrical degrees from the field winding. Since the motor used in this experiment us a 4-pole motor, the mechanical displacement is 450. The compensating winding also improves commutation considerably. This is a great adventure since the field of a universal motor commutation considerably. is weakened by lowering the reactance of the series field winding. If the compensating winding is short circuited (inductive compensation), the alternating currents in the armature are induced by transformer action into the shorted compensating winding, thus, effectively cancelling the reactive armature currents. The starting torque of a universal motor is determined by the current that flows through the armature and field windings. Due to the inductive reactance of these windings the AC starting current will always be less than the DC starting current (with equal supply voltages). Consequently, the starting torque on AC power will be lower than the starting torque on DC power.